How are you doing with drinking that water? Even after all these months I find it difficult to keep up my water intake. Today’s tip comes from my friend Monique. She snipped a few stems of lemon balm from her backyard, which is one of my very favorites. Though not especially large, it boasts little paths through trees, flowers, herbs, and veggies, somehow looking beautiful and organic, cared about and free, all at the same time. 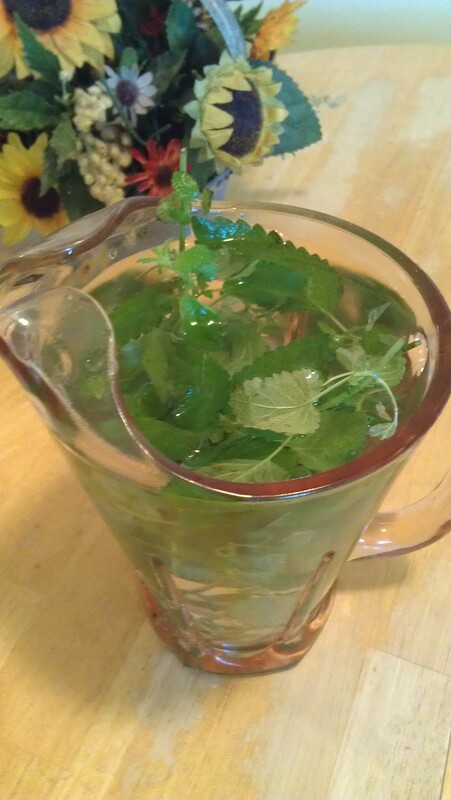 Monique suggested I put the lemon balm in a pitcher of water and enjoy. I discovered two things about this treat. 1) It needs to sit longer than lavender or mint to infuse the water with its properties. I recommend overnight. 2) It doesn’t last as long as lavender or mint and fresh stems/leaves need to be added more often to enjoy optimal flavor. My next goal is to get a cutting from my friend and grow my own lemon balm plant to harvest. Another idea for gently flavored water comes from my friend Kristin, who slices a few strawberries into a pitcher and leaves it overnight. And I added cucumber slices to my water glass at dinner recently. Do you have a hydration tip to share? Great advice, thank you! And a friend has offered me a different kind of mint, too, so I think I need several big barrels to plant the two mints and the lemon balm in . . . And I have some overrun strawberries and rhubarb plants, so I think I need to replant them where I can give them better attention, too.